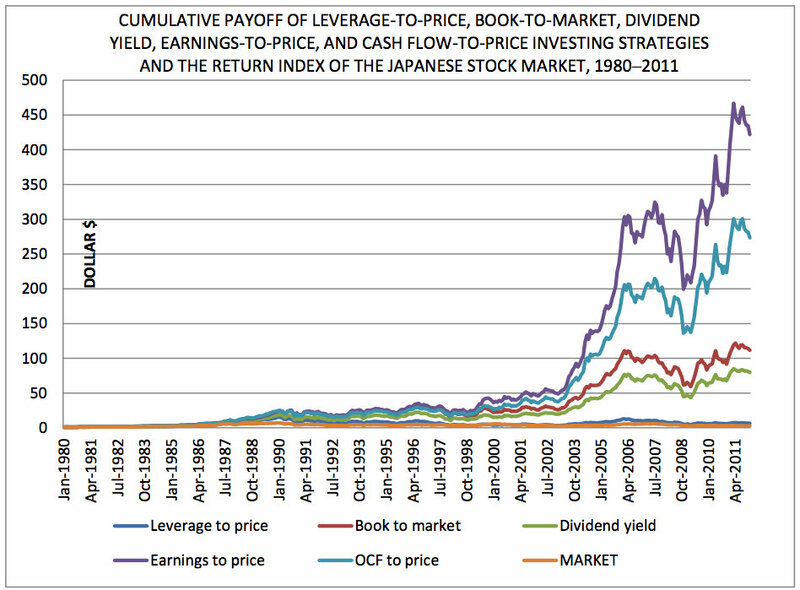 Has value investing worked in Japan’s long bear market (1990 to 2011)? The Hong Kong University of Science and Technology Value Partners Center for Investing has examined the performance of value stocks in the Japanese stock market over the period January 1975 to December 2011. They have also broken out the performance of value stocks during Japan’s long-term bear market over the 1990 to 2011 period, when the stock market dropped 62.21 percent. The portfolios were rebalanced monthly over the full 37 years. The authors find the value quintile of equal-weighted portfolios book-to-market, dividend yield, earning-to-price, cash flow-to-price, and leverage-to-price generated monthly returns of 1.48 percent (19.3 percent per year), 1.34 percent (17.3 percent per year), 1.78 percent (23.6 percent per year), 1.66 percent (21.8 percent per year) and 0.78 (9.8 percent per year) percent in the 1975–2011 period. They find similar results for market capitalization-weighted portfolios sorted by these measures, as well as for three-, six-, nine-, and twelve-month holding periods (excluding the leverage-to-price ratio). They also investigated the cumulative payoff in dollar terms of investing $1 in the portfolios having the highest values of our value measures with monthly portfolio rebalancing in the 1980–2011 period. Value investing strategies based on stock’s book-to-market, dividend yield, earning-to-price , cash flow-to-price , and leverage-to-price grew $1 into $115.98, $81.88, $433.86, $281.49, and $6.62 respectively, while the aggregate stock market turned $1 into a mere $2.76, in the 1980–2011 period. This implies that these value investing strategies rewarded investors 42.0, 29.6, 157, 102 and 2.40 times what the Japanese stock market did. The effective monthly compound returns of the various investing strategies are 1.25 percent, 1.16 percent, 1.60 percent, 1.48 percent and 0.49 percent, while the aggregate stock market only delivered 0.27 percent in this period. 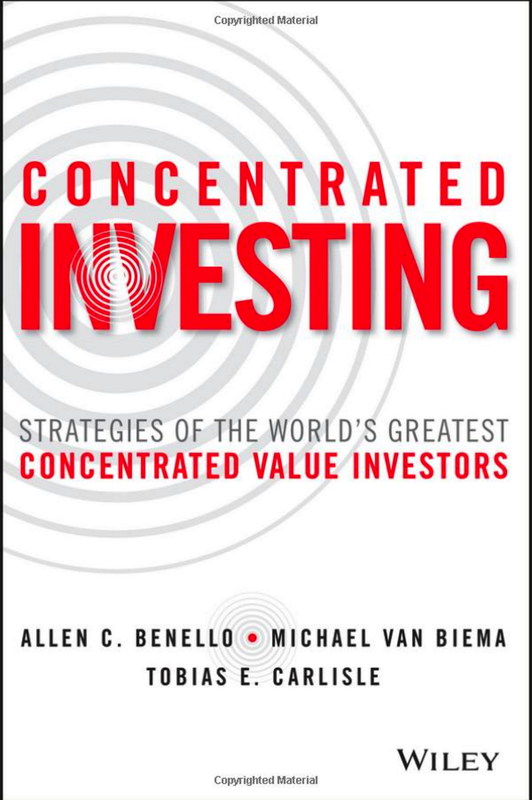 Four out of five value investing strategies actually rewarded investors with positive returns in the bear market that spanned two decades from 1990 to 2011, turning $1 into $4.77, $4.25, $17.17, and $10.91, implying profits of 377 percent, 325 percent, 1617 percent, and 991 percent respectively, while the stock market plunged 62.21 percent after reaching its peak in January 1990. In addition, every one of these value investing strategies continued to generate positive returns between the pre-global financial crisis peak in 2007 and December 2011. 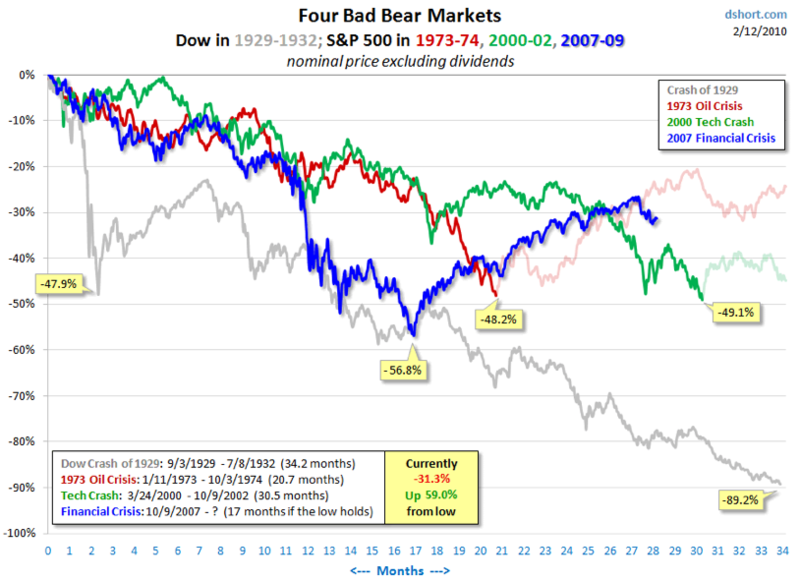 Anyone who thinks that the bounce means that the current bear market is over would do well to study the behavior of bear markets past (quite aside from simply looking at the plethora of data about the economy in general, the cyclical nature of long-run corporate earnings and price-earnings multiples over the same cycle). They might find it a sobering experience. It’s interesting for me because it compares the Dow Crash of 1929 (from which Graham forged his “Net Net” strategy) to the present experience in the US and Japan (both of which offer the most Net-Net opportunities globally). Where are we going from here? Que sais-je? 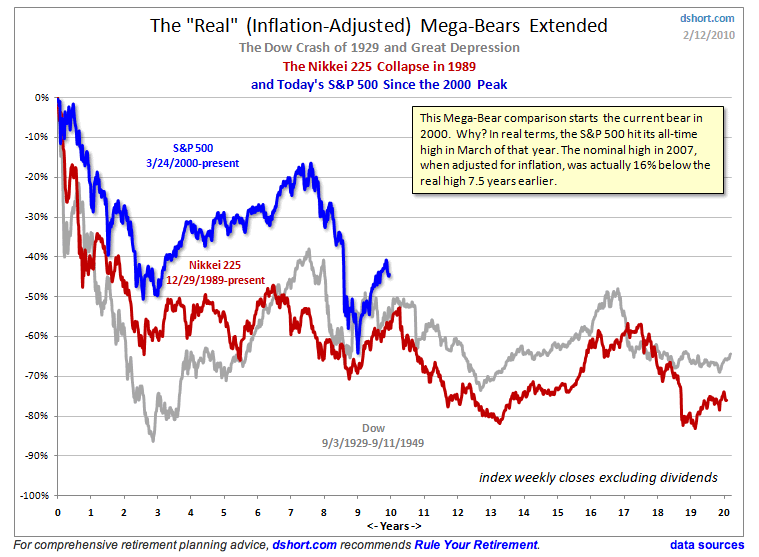 The one thing I do know is that 10 more years of a down or sideways market is, unfortunately, a real possibility. Fer it: Net current asset value stocks have performed remarkably well throughout the investing world and over time. In support of this argument I cite generally Graham’s experience, Oppenheimer’s Ben Graham’s Net Current Asset Values: A Performance Update paper, Testing Ben Graham’s Net Current Asset Value Strategy in London, a paper from the business school of the University of Salford in the UK, and, more specifically, Bildersee, Cheh and Zutshi’s The performance of Japanese common stocks in relation to their net current asset values, James Montier’s Graham’s net-nets: outdated or outstanding?, and Dylan Grice’s Are Japanese equities worth more dead than alive. Agin it: Japan is a special case because it has weak shareholder rights and a culture that regards corporations as “social institutions with a duty to provide stable employment and consider the needs of employees and the community at large, not just shareholders.” In support of this argument I cite the recent experiences of activist investors in Japan, and Bildersee, Cheh and Zutshi’s The performance of Japanese common stocks in relation to their net current asset values (yes, it supports both sides of the argument). Further, the prospects for Japan’s economy are poor due to its large government debt and ageing population. We appear to use stories to help us reach decisions. In the ‘rational’ view of the world we observe the evidence, we then weigh the evidence, and finally we come to our decision. Of course, in the rational view we all collect the evidence in a well-behaved unbiased fashion. … Usually we are prone to only look for the information that happens to agree with us (confirmatory bias), etc. However, the real world of behaviour is a long way from the rational viewpoint, and not just in the realm of information gathering. The second stage of the rational decision is weighing the evidence. However, as the diagram below shows, a more commonly encountered approach is to construct a narrative to explain the evidence that has been gathered (the story model of thinking). Hastie and Pennington (2000) are the leading advocates of the story view (also known as explanation-based decision-making). The central hypothesis of the explanation-based view is that the decision maker constructs a summary story of the evidence and then uses this story, rather than the original raw evidence, to make their final decision. All too often investors are sucked into plausible sounding story. Indeed, underlying some of the most noted bubbles in history are kernels of truth. As to the last point, arguably, the converse is also true. Investors have missed some great returns because the ugly stories about companies or markets were so compelling. I believe that value investing works. I believe that this is the case because it appeals to me as a matter of logic. I also believe that the data supports this position (see Ben Graham’s Net Current Asset Values: A Performance Update or Lakonishok, Shleifer, and Vishny’s Contrarian Investment, Extrapolation and Risk). Where a stock trades at a significant discount to its value, I am going to take a position. I believe that Graham’s net current asset value works. In support of this proposition I cite the papers listed in the “Fer it” argument above. I believe that simple quantitative models consistently outperform expert judgements. In support of this proposition generally I cite James Montier’s Painting By Numbers: An Ode To Quant. Where the data looks favorable to me, I am going to take a position, and I’m going to ignore the qualitative factors. I believe that value is a good predictor of returns at a market level. In support I cite the Dimson, Marsh and Staunton research. I am not dissuaded from investing in a country simply because its growth prospects are low. 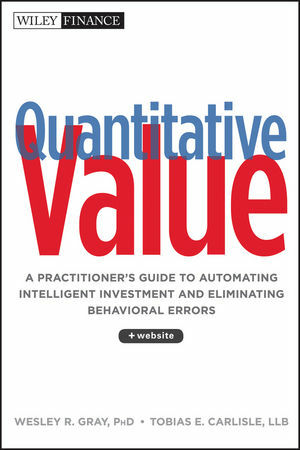 Value is the signal predictor of returns. The arguments militating against investing in Japan sound to me like the arguments militating against any investment in a NCAV stock, which is to say that they are arguments rooted in the narrative. I’ve never taken a position in a NCAV stock that had a good story attached to it. They have always looked ugly from an earnings or narrative perspective (otherwise, they’d be trading at a higher price). As far as I can tell, this situation is no different, other than the fact that it is in a different country and the country has economic problems (which I would ignore in the usual case anyway). While the research specific to NCAV stocks in Japan is not as compelling as I would like it to be, I always bear in mind the lessons of Taleb’s “naive empiricist,” which is to say that the data are useful only up to a point. This is not to say that I have any great conviction about Japan or Japanese net current asset value stocks. Far from it. I fully expect, as I always do when taking a position in any stock, to be wrong and have the situation follow the narrative. Fortunately, the decision is out of my hands. I’m going to follow my simple quantitative model – the Graham net current asset value strategy – and take some positions in Japanese net nets. The rest is for the goddess Fortuna. Corollary I. Such a price should impel the stockholders to raise the question whether it is in their interest to continue the business. Corollary II. Such a price should impel the management to take all proper steps to correct the obvious disparity between market quotation and intrinsic value, including a reconsideration of its own policies and a frank justification to the stockholders of its decision to continue the business. Japanese businessmen and politicians fear that the activists are short-term investors keen to strip firms of their cash. The conflict highlights a fundamental divide: companies in Japan are social institutions with a duty to provide stable employment and consider the needs of employees and the community at large, not just shareholders. And therein lies the rub. Companies in Japan are social institutions with a duty to provide stable employment and consider the needs of employees and the community at large, not just shareholders. Can foreign investors not subject to the cultural expectation that companies consider the needs of employees and the community at large succeed? Despite the support shown by elected officials for increasing [foreign direct investment] in Japan, foreign investors still face a substantial amount of bureaucratic red tape, particularly with respect to protected industries. [Direct investment] is principally governed by the Foreign Exchange and Foreign Trade Control Law, which specifically prevents foreign investors from acquiring a majority stake in Japanese companies within industry sectors classified as closely related to national security and public safety. This includes industries as diverse as aeronautics, defense, nuclear power generation, energy, telecom, broadcasting, railways, tourist transportation, petroleum and leather processing. Foreign investors intending to make direct investments in certain industries must file with the Japanese Ministry of Finance as well as the respective ministry governing the specific industry of the investment target. If issues are found in relation to the investment, either the Ministry of Finance or the industry-specific ministry has the authority to issue an official recommendation to revise the investment plan or to put a complete stop to the acquisition. Industry-specific regulations that, for example, limit foreign ownership to one-third for airline and telecom companies, further constrain foreign investors. Steel Partners has imported its U.S. activist investment model to Japan and has shown a willingness to question publicly the strategy of current management at its investment targets and to litigate disagreements. The biggest showdown between the activists and the establishment is at J-Power, the former state-run energy firm, which was privatised in 2004. [TCI] a British fund, which owns 9.9% of the firm, has been politely but firmly lobbying J-Power to appoint two TCI representatives to its board, improve margins and unwind cross-shareholdings with other firms. Having been rebuffed, TCI now wants to double its bet. In January it asked for permission to increase its stake to 20% (any holding above 10% requires government approval). John Ho, the head of TCI’s Asian operations, says the deal is a test of the integrity of Japan’s reform agenda. And it would be, except that Mr Ho has chosen a remarkably hard case. Japan, lacking natural resources, is worried about energy security and is reluctant to hand more control over its power infrastructure to foreign investors. After applying for approval to increase shareholdings to 20%, TCI met a wall of resistance: J-Power management cautioned that TCI could cut maintenance and investment costs in nuclear plants, and the Japanese media relayed sensationalist warnings about the potential for “blackouts.” The result: The Japanese government blocked the investment. To be blunt, shareholders in general do not have the ability to run a company. They are fickle and irresponsible. They only take on a limited responsibility, but they greedily demand high dividend payments. High dividend payments? We’re a long way from liquidation as a matter of course. 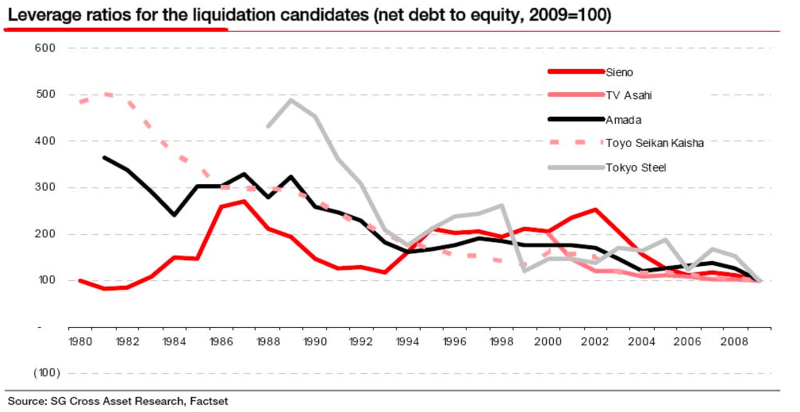 The following chart shows the debt to shareholders equity ratios for each of the stocks highlighted as a liquidation candidate above, rebased so that the last year’s number equals 100. It’s clear that these companies have been aggressively delivering in the last decade. But as it happens, most of these companies have also been buying back stock too. So per share book values have been rising steadily throughout the appalling macro climate these companies have found themselves in. Contrary to what I expected to find, these companies that are currently priced at levels making liquidation seem the most profitable option have in fact been steadily creating shareholder wealth. This is really extraordinary. The currency is a risk that I can’t quantify, but it warrants further investigation. Since last week’s Japanese liquidation value: 1932 US redux post, I’ve been attempting to determine whether the historical performance of Japanese sub-liquidation value stocks matches the experience in the US, which has been outstanding since the strategy was first identified by Benjamin Graham in 1932. The risk to the Japanese net net experience is the perception (rightly or not) that the weakness of shareholder rights in Japan means that net current asset value stocks there are destined to continue to trade at a discount to net current asset value. 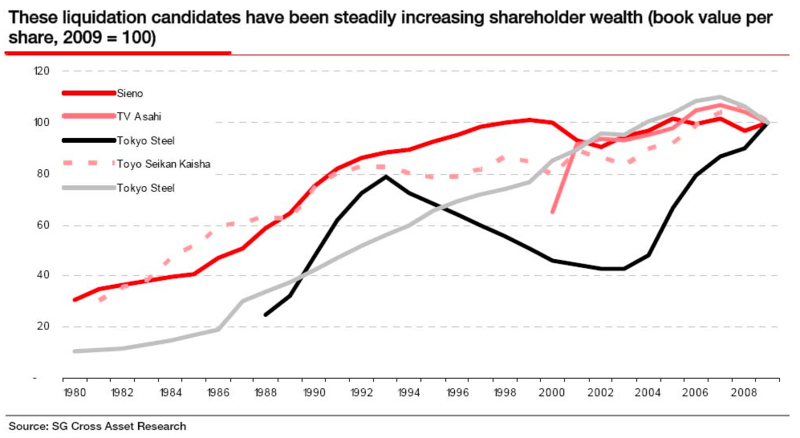 As I mentioned yesterday, I’m a little chary of the “Japan has weak shareholder rights” narrative. I’d rather look at the data, but the data are a little wanting. As we all know, the US net net experience has been very good. Research undertaken by Professor Henry Oppenheimer on Graham’s liquidation value strategy between 1970 and 1983, published in the paper Ben Graham’s Net Current Asset Values: A Performance Update, indicates that “[the] mean return from net current asset stocks for the 13-year period was 29.4% per year versus 11.5% per year for the NYSE-AMEX Index. One million dollars invested in the net current asset portfolio on December 31, 1970 would have increased to $25,497,300 by December 31, 1983.” That’s an outstanding return. In the first study outside of the USA, Bildersee, Cheh and Zutshi (1993)’s paper focuses on the Japanese market from 1975 to 1988. In order to maintain a sample large enough for cross-sectional analysis, Graham’s criterion was relaxed so that firms are required to merely have an NCAV/MV ratio greater than zero. They found the mean market-adjusted return of the aggregate portfolio is around 1 percent per month (13 percent per year). Many of the “assets” on public companies’ books at that time were real estate bubble-related. At the peak in 1989, the aggregate market price for all private real estate in the city of Tokyo was purportedly greater than that of the entire state of California. You can see how the sudden runup in real estate during the bubble could cause asset-heavy companies to outperform the market. So a better crucible for Japanese NCAVs might be the deflationary period, say beginning 1/1/90, which is more analogous to the US in 1932. It was not possible to track all of the stocks identified by Montier. Where I couldn’t find a closing price for a stock, I’ve excluded it from the results and marked the stock as “N/A”. I’ve had to exclude 18 of 84 stocks, which is a meaningful proportion. It’s possible that these stocks were either taken over or went bust, and so would have had an effect on the results not reflected in my results. The opening prices were not always available. In some instances I had to use the price on another date close to the opening date (i.e +/1 month). The 68 stocks tracked gained on average 0.5% between September 2008 and February 2010, which is a disappointing outcome. The results relative to the Japanese index are a little better. By way of comparison, the Nikkei 225 (roughly equivalent to the DJIA) fell from 12,834 to close yesterday at 10,057, a drop of 21.6%. Encouragingly, the net nets outperformed the N225 by a little over 21%. The paucity of the data is a real problem for this study. I’ll update this post as I find more complete data or a more recent study.